Sandesh is a soft on bite sweet fudge prepared with fresh chenna. 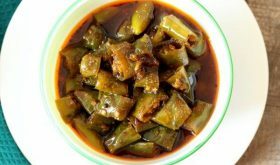 It is prepared for special occasions and festivals like Durga puja and Diwali. 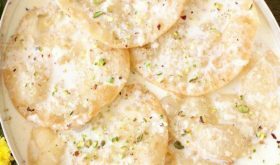 There are many variations to the basic sandesh recipe in terms of flavor and texture, and is beautifully colored and moulded to different shapes and sizes. 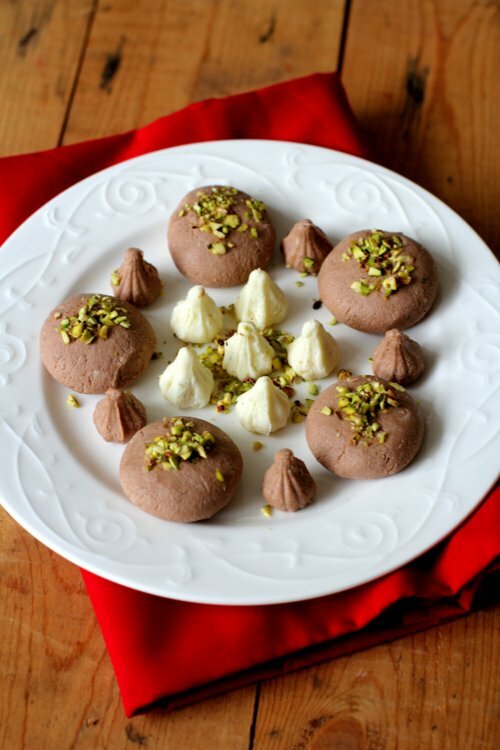 I love the versatility of sandesh and a popular variation is chocolate sandesh. 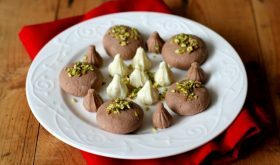 If you are looking at desserts to serve kids at a party, you should be looking at giving chocolate sandesh recipe a try. Fresh chenna is the most important part of making sandesh and I have shared detailed instructions including step by step photos on how to make chenna in this blog post even though I posted the paneer recipe earlier (fresh chenna that is drained of all its liquid and allowed to set under a heavy weight yields paneer). You can use cocoa powder, drinking chocolate or melted chocolate to make chocolate sandesh recipe. Heat milk in a heavy bottomed vessel and bring to a boil. Reduce heat to low. 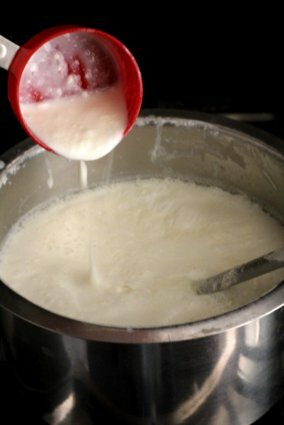 Whisk curd till smooth and slowly allow it to trickle into the hot mlk and keep stirring continuously. Don't add all the curd at once. 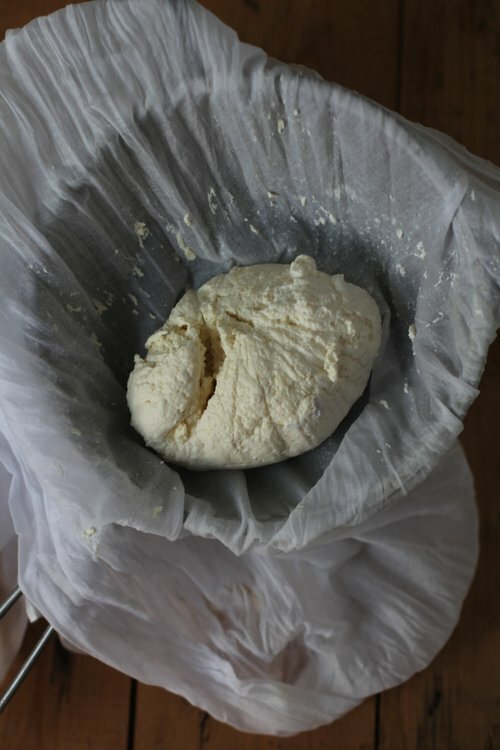 The milk will begin curdling with milk solids forming aling with a greenish color thin liquid called whey. 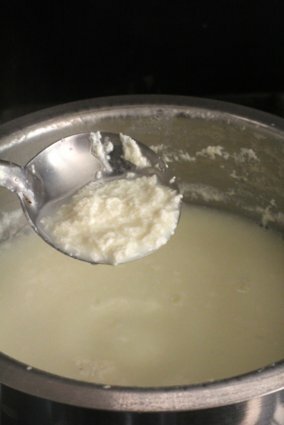 If the milk does not curdle after adding all the curd, add another 1-2 tbsps of curd to curdle it. Turn off flame. Immediately add 8-10 ice cubes to the vessel to stop the the milk solids from cooking further. Allow to rest for 5 mts. 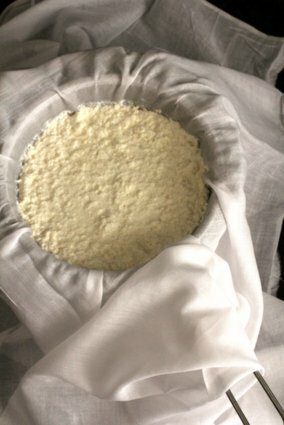 Bring the edges of the cloth on all four corners and gently squeeze the milk solids (chenna) two to three times so that excess liquid is removed. 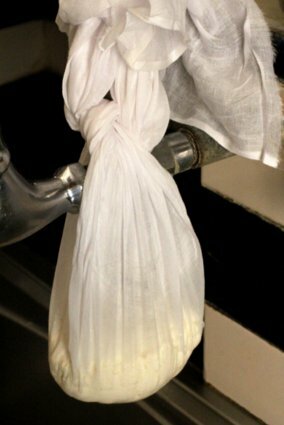 Now tie a knot so that you can hang it at a height for the excess liquid to drain. Leave it aside for 20 mts. 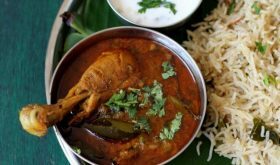 Your chenna is ready. Knead the chenna for 7-8 mts. Add powdered sugar and cocoa powder and knead again for 4-5 mts. 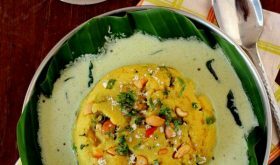 Heat ghee in a wide shallow pan, add the kneaded chenna mixture and cook on very low flame. You will see that the mixture will let out moisture and gets mushy and sticky . Keep stirring on low flame and allow the mixture to come together like a mass. It will start to leave the sides of the pan with a bit of moisture retained. Do not let it get crumbly or too dry. Turn off flame and allow the mixture to cool a bit but it should be warm. Knead the cooked chenna mixture gently for a mt, make small balls of the mixture and lightly flatten them. Garnish with finely chopped pistachios. You can serve them chilled or at room temperature. Pinch of cinnamon powder or 2 drops of vanilla essence can be added. Ensure that the mixture is still warm while shaping balls out the cooked and kneaded chenna. Do not allow the mixture to cool completely as it it not be easy to make smooth balls. By Sailu Published: February 20, 2015 Chocolate sandesh recipe. 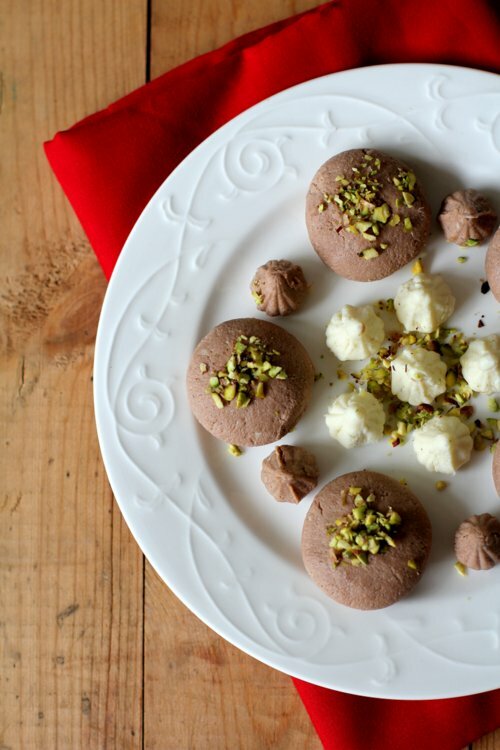 Learn how to make chocolate sandesh. Sandesh, a bengali sweets recipe is made with fresh chenna, powdered sugar and chocolate. Looks very nice Sailu. By the way how did you manage to shape those tiny looking ones like Modak? Do u have a mould to do that? 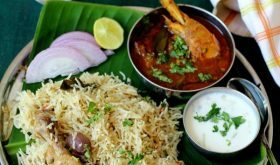 Looks very delicious.I love trying different cuisines and your recipe is really very good and easy to cook.Thanks for sharing your recipe.